F.I.R. 's top range, the Alpha series, features a combination of hub and tread both made from top quality TPU. 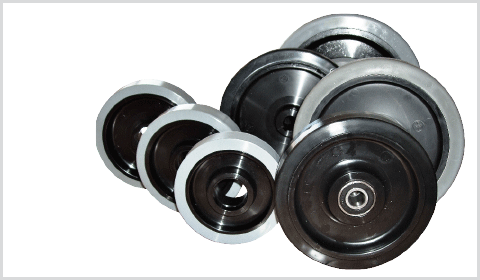 These wheels have both mechanical and chemical interlocking systems making them exceptionally strong. They are ideal for high speed applications of up to 10 km/h or 6 mph. They are very durable and resistant to tearing. The elastic polyurethane, from 70 to 80 Shore A, allows excellent grip and the ability to overcome obstacles. 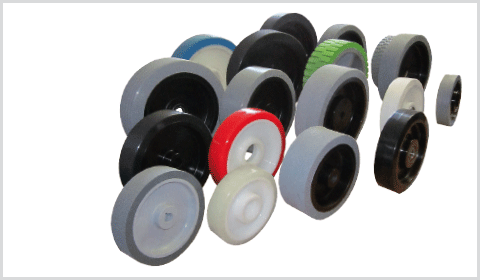 The wheels are noiseless and do not vibrate; they are suited to most surfaces. Available in different colors, sizes and surface patterns. Available with double ball bearings, key seat or flanged hub. F.I.R. 's most popular range, the Beta series, features a combination of hub made in polyamide 6 and tread made from top quality TPU. These wheels have mechanical interlocking system. This series has the best price-quality ratio. The wheels are very strong, durable and resistant to tearing. They are ideal for applications that require a speed of up to 6 km/h or 4 mph. The elastic polyurethane, from 70 to 80 Shore A, allows excellent grip and the ability to overcome obstacles. The wheels are noiseless and do not vibrate. They are suited to most surfaces. F.I.R. 's budget range, the Gamma series, features a combination of hub made in polypropylene and tread made from thermoplastic elastomer. 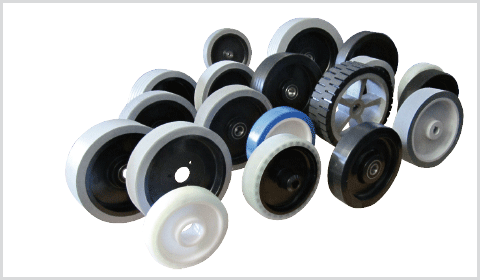 These wheels have both mechanical and chemical interlocking systems. This series is best suited for low loads (up to 180 kg or 395 lb) and they are ideal for applications that require a speed of up to 4 km/h or 2.5 mph. The elastic elastomer, from 60 to 80 Shore A, allows excellent grip. The wheels are noiseless and do not vibrate. 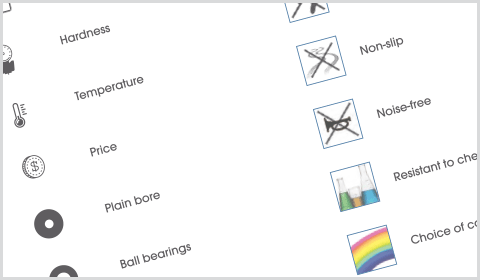 They are suited to mostly smooth surfaces.